When this book first came out in 1999, it was a huge hit. 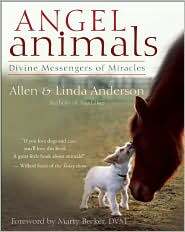 Readers of New Age nonfiction are often huge animal lovers, and so a book about how animals touch our lives is bound to be well accepted. The Andersons collected personal stories from numerous people around the world, talking about their experiences with animals ranging from lizards to parrots, horses to ferrets, and, of course, cats and dogs. It’s a sweet compilation, with a lot of heartwarming stories. It’s a great book for when you’re feeling down, though be aware that there are some tearjerkers in there. The voices of the writers who contributed are sincere, and though it’s obvious that not all of them are professionals, they still all manage to convey feeling and meaning in their tales. The Andersons have added a meditation at the end of each story to help readers to learn more from what they’ve read. There were a few times where I had to really look askance at peoples’ interpretations of the meaning behind the animals’ actions. I think sometimes we so adore animals that we anthropomorphize them beyond their actual capabilities. I have to wonder how much of these stories are the animals actually being aware of what they’re doing, and how much are the people projecting their wishes and desires onto the animals. Still, it’s a nice read, and it kept me company on an all-day plane flight. Well-written, wonderful premise, and worth picking up.